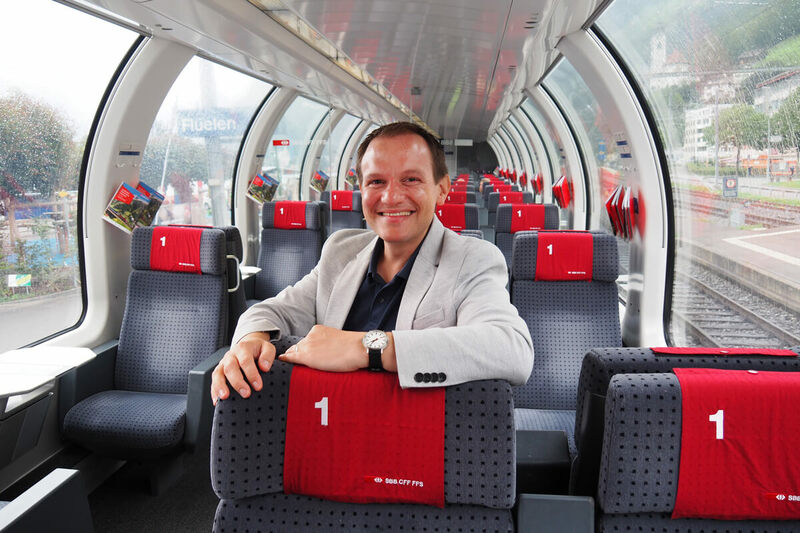 There are faster ways to travel from northern to southern Switzerland than with the Gotthard Panorama Express. As frequent travelers to Ticino, we appreciate the time savings that the world’s longest railway tunnel provides. But we also feel nostalgic about the pre-2016 times when trains would climb the massive Gotthard pass before crossing through the historic rail tunnel. We are still standing underneath the large Swiss Railway clock inside Zürich’s main station. About to embark on a journey that will take no less than 6.5 hours from start to finish, Mamiko and I decide to cross-check our Mondaine wrist watches and set them to "rail time." With three transfers among trains and a steam boat, we better be running right on time, no? The Official Swiss Railway clock plays an important role in ensuring the punctuality of Switzerland’s public transportation system. Surely, you must have observed how the station clock’s seconds digit briefly stops at the top of the hour? This break used to have practical purposes: when the Swiss Railway clock was designed back in 1944, the 1.5 second break served as a way of synchronizing all the clocks at the top of the minute. Every 60 seconds, a central hub would broadcast a signal in order for the clocks to start the next minute. Since it took 1.5 seconds for the signal to reach the furthest station clock, a stop was introduced. Now, for a brief history of the Gotthard pass. While our intercity train zips towards Lucerne, we review the history of the Gotthard pass as it pertains to transportation. Through the 13th century, the only way to get across the alps was by negotiating the slippery granite mountain. Slowly, cliff-hugging wooden paths and bridges were built for the transport of goods. With the advent of the railroad, an innovative Swiss engineer devised a way to cross the Gotthard by a series of viaducts, switchbacks and a tunnel. The construction of the 15 km long Gotthard rail tunnel was no easy feat, causing many deaths among workers. It was completed in 1882 after only 10 years, however, and has been the default way of crossing the alps. In Lucerne, we are right on time to embark on the Gotthard Panorama Express. Lucerne is still waking up on this Saturday morning and the Chapel Bridge is void of any tourists. Just outside the train station, we embark on a historic steam boat which will take us to Flüelen at the other end of the lake. And perhaps it is fitting that this panoramic journey begins near the Swiss Museum of Transport. There, all the historic coaches and locomotives which have ever crossed the Gotthard pass are resting side by side. The boat ride takes nearly three hours, so it is a good thing that the scenery never ceases to amaze us. 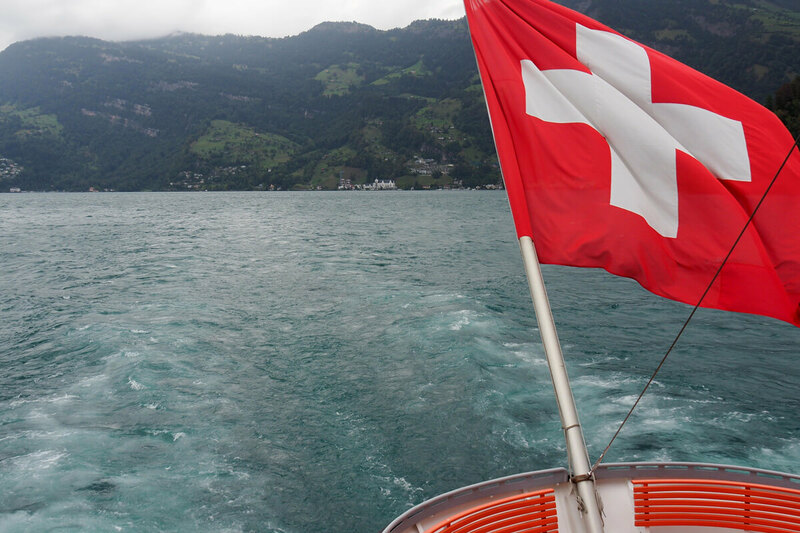 From the charming boat landing in Vitznau to the legendary Tell's Chapel, we are constantly engaged. While we are indulging in the restaurant's delicious menu featuring local specialties, the engine in the belly of the steamer keeps chugging away. For most of the trip, we stay in the Queens Salon, a historic first-class suite at the front of the boat. Before we know it, the time is up and the captain announces the final destination: Flüelen. Mamiko with her stylish souvenir hat quickly finishes up some postcards and we debark. A smooth switch from the boat to the waiting panoramic train. It does not take a train geek to be in awe of the level of luxury on these exclusive coaches! For one, the entire wagon has been raised in order to provide unobstructed views. The windows are larger than life, too. Truly, there are no bad seats on the Gotthard Panorama Express! Once on the way, the guides move about and introduce themselves. Our guide notices the camera and offers to point out any highlights ahead of time. What a service! During the first half of the trip, the train’s speakers play (seemingly endless) recordings explaining the history of the Gotthard route. This added information may be relevant to some passengers. Instead, we prefer chatting with our guide who tells us fascinating anecdotes about his upbringing in the canton of Uri. In sunny Lugano, we check into the lakeside Hotel Walter au Lac. The location of the Hotel Walter au Lac in the center of Lugano is superb. A block apart is the sleek LAC Lugano, a cultural center and contemporary art museum. And just in front is the sprawling lake promenade with its gelato booths and pedal boat rentals. We stroll past a much-photographed gate inside a romantic park and continue all the way to the public baths at the foot of Monte Brè. 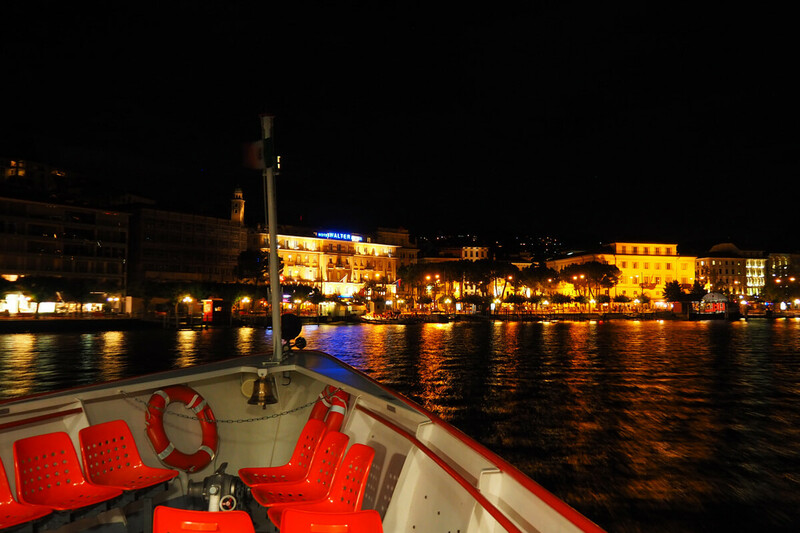 While there are countless restaurants in Lugano’s old town, we decide for a rather unique dinner experience: a grotti cruise. "Grotto" is the name for a typical restaurant here in the Ticino region. Usually featuring outdoor seating, a grotto will serve up local delicacies from polenta to cheese and salami meats. The cool thing about the Lugano Grotti Cruise is that the boat stops at several restaurants along Lake Lugano. During the course of one evening, the boat will complete two entire loops at two hours apart, providing ample time to dine and catch a ride back to Lugano. Have a look at these delicious bruschetta and those boar salami sausages we ordered at Grotto Teresa in Gandria... Now you know why we will be back for more! By the time we return from the grotto dinner, it is almost midnight and we head straight to bed. We are itching to review all the photographs we took from north to south. But first, we will need a good night's sleep to process all the impressions in our own minds... Our Mondaine alarm clock is set for 8 AM the next morning. Lugano offers much to see and do, and we would not want to miss any of it! It is definitely worth upgrading the journey to first class. Why? This classic Swiss boat and rail adventure deserves to be enjoyed from the upper deck and through panoramic windows! And since the ride takes up to six hours, the cushy seats offer that premium experience you deserve.